All Parents automatically belong to the ‘Parents & Friends Association’ (PFA), but being a ‘Friends’ association, membership is not confined to Parents, but is extended to include other family relations and members of the public who have been approved by the Committee. The objective of the PFA is to support the school and its students, and to allow the children to enjoy their time at WGSG to the greatest extent possible. The PFA organises a varied programme of events during the year for the students and parents, including fund-raising events to provide additional resources for the benefit of the students, over and above those that would be available from existing school funds. Easyfundraising - By signing up and using the following link when you shop online with more than 3,300 well-known online stores such as Amazon, eBay, John Lewis will earn free donations for WGSG at no additional cost to you. Please click here for further information and to sign up. 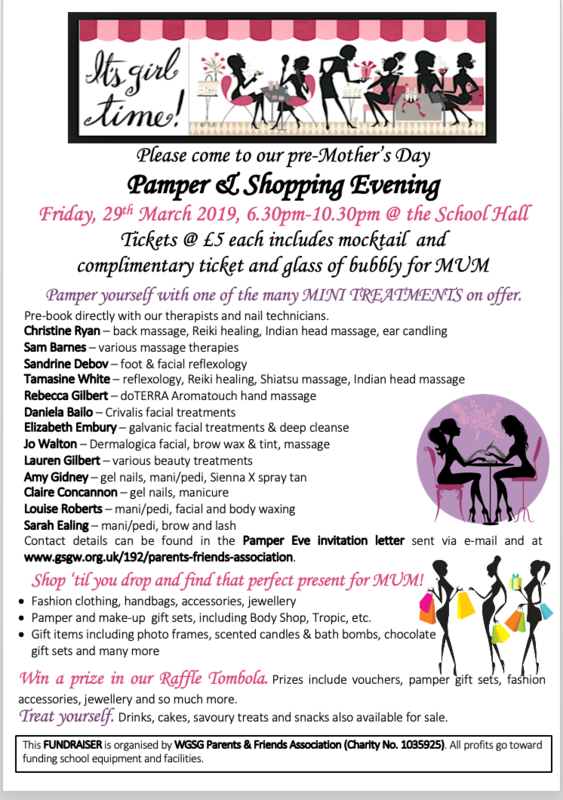 Sponsorships and donations – We would appreciate any support that you can offer by way of sponsorships, grants, ‘match funding’, raffle prize donations, etc. Please contact us (link below) if you can help support the PFA in this capacity. ‘Nearly New’ School Uniform Shop – We have a range of second-hand uniform in excellent condition for sale at very reasonable prices and any donations of surplus school uniform are most gratefully received. For details & price list or to make a uniform donation, please contact Jo Fish-Halvorsen at fishhalvo@outlook.com. WGSG Monthly Draw – Full details and Standing Order Forms are found on our webpage. We are always looking for new ideas for fundraising events, so please get in touch (link below) if you feel there is something we should try. The PFA is only possible with the active help and support of the parents, friends and relatives. We are a relatively small, friendly group but we do need more people. If you are able to spare some time, we urge you to become more involved in the PFA – and help make a difference. You could choose to be either a regular member (as part of the PFA committee), or a volunteer and help out occasionally at events. There are no minimum time commitments. We hold five to six Committee meetings a year and our Annual General Meeting is in October. Everyone is welcome to attend any of our meetings. Dates and times can be found in the school calendar, blog and twitter. You may contact the Chairman (link below) by email or through the School Office.